Denon AVR-X3500H review | What Hi-Fi? Maintaining supremacy in the marketplace isn’t usually achieved by standing still. Nor is it brought about by completely remapping the route that led to success in the first place. Denon knows that inertia leads to stagnation, so the key is finding a balance between small but effective alterations and making empty revisions simply for the sake of it. The question is not so much whether Denon can convince its customers to upgrade their systems every year, but that it remains at the forefront of home cinema amplifier design, especially at entry-level and mid-range price points. 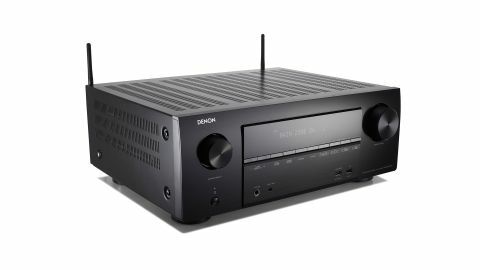 Thankfully, the Denon AVR-X3500H takes a step forward from its already class-leading predecessor. The fundamentals remain the same – the Denon AVR-X3500H is a 7.2 channel amp, with two of the channels assignable as either surround back or for height, making use of Dolby Atmos, DTS:X and DTS Virtual:X technologies. Physical connections are similar to those on last year’s model, the AVR-X3400H, with eight HDMI inputs and three outputs, each capable of 4K HDR pass-through. Denon has also added a phono input. In line with the company’s desire to progress this range from home cinema amps to a home entertainment hub, the major additions to this year’s feature list are Alexa Voice Control and Apple AirPlay 2. The amp can also be a hub for a HEOS multi-room set-up. Under the bonnet, the changes are consistent with Denon’s little-and-often approach to upgrading parts. The company has revealed that the DAC, DSP, power transformer, block capacitors and mechanics have remained unchanged, though they were already at a high level for the price. Instead, Denon has focused on bettering the surrounding parts, making component changes to the pre-amplifier power supply, power amplifier and DAC circuit. These changes have led to marginal, but effective, gains in the amplifier’s overall performance. Set-up is guided by the on-board Audyssey software, which is still one of the most accurate, speedy and easy-to-use system we’ve come across. It takes us step-by-step through speaker configuration and automated level adjustments. From there, it’s business as usual as the AVR-X3500H greets us with Denon’s recognisably bold and open soundstage, ticking boxes across the board while allowing us to become immersed in whichever source we choose. When we reviewed this amp’s smaller sibling, the AVR-X2500H, we celebrated the muscle it had gained over its predecessor. The AVR-X3500H had no such ground to make up, but it soon becomes clear that Denon has focused on added authority across the range. It is comfortable driving our reference PMC Twenty5 package through the rumbles and thumps of a high-action thriller, with the added solidity felt across the board as voices and soundtracks benefit from its authority and stability. That even but full balance is also unchanged, with plenty of detailed low-end not only making the action more convincing, but also delivering a performance that is consistently easy on the ears. With so much power, you could easily become fatigued by the intensity, but this Denon has a knack of being welcoming even when conveying the most chaotic scenes. Denon has managed this without forgoing subtlety or dynamics. The AVR-X3500H is as comfortable placing its light touch over staid drama as it is providing the punch in an action-heavy scene. It proves its ability to change gears as and when the source material demands. This approach translates to music playback too, which is why Denon has placed the focus on the AVR-X3500H as an all-round entertainment system rather than simply pass-through for your home cinema. Where so many AV amps struggle, this one delivers music consummately with the rhythmic and dynamic understanding we’d expect from a stereo counterpart. Though it can’t compare with a dedicated stereo amplifier, we are more than happy listening to it drive our PMC Twenty5.23s.